In Stepping Stones’ Saturday Kids Club, children and young teens with disabilities are at the center of the action! 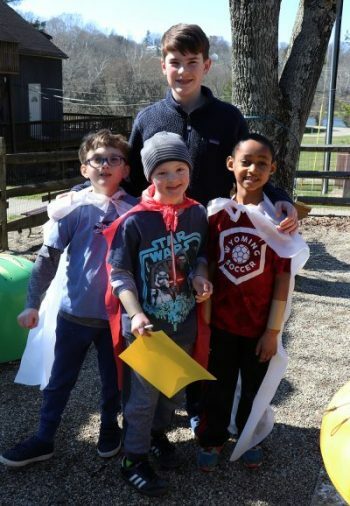 Saturday Kids Club is a fun, recreation program that runs during the school-year at our beautiful Given Campus in Indian Hill. Participants build friendships and engage in fun, age-appropriate activities in an interactive environment. Art Projects, Outdoor Activities, Sports, Music, Holiday Parties & More! Stay tuned! Saturday Kids Club is currently in its off-season as Stepping Stones leads our popular Summer Day Camp program. Fall 2019 and 2020 dates will be announced in early July. For more information about Saturday Kids Club, please contact Jeannie Ludwig in Client Services at (513) 965-5108. Saturday Kids Club is currently in its off season as we lead our popular Summer Day Camp program. Fall 2019 and 2020 club dates will be announced in early July. If a participant needs to be absent for any reason, please contact the Program Coordinator via the Attendance Hotline.